a major college football stadium? the top rows of the upper deck. of pure Cu (copper) would have 2.4 x 1022 atoms. approximately 2.4 x 109 KILOMETERS long. 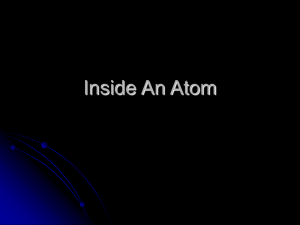 simple picture of an atom. S What did you draw? S Protons (in the nucleus). S Neutrons (in the nucleus). 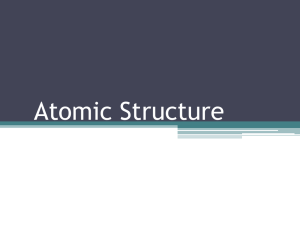 S Electrons (moving around the nucleus). 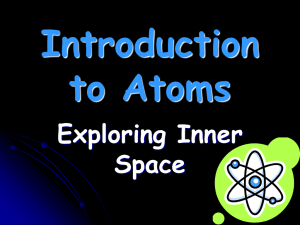 S Atoms can gain or lose electrons. S Atoms can NEVER gain or lose protons! S If an atom gains an electron, it becomes a negative ion. If it is not an ion! neutrons. This was done in 1932.
neutrons. 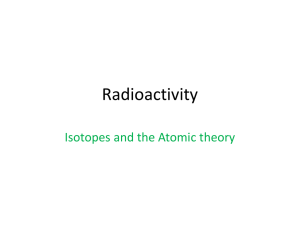 These are called ISOTOPES. S It’s the strongest force in the universe. when they are packed together in the nucleus. S Protons and neutrons are made of quarks. 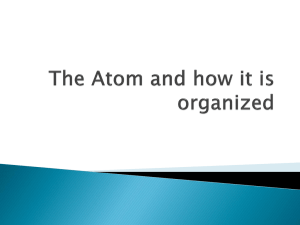 neutrons actually help to hold the nucleus together. help to predict its behavior. protons = # of electrons. S The number of protons cannot change. 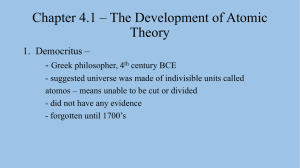 part of Daltons’s Atomic Theory. S To calculate the number of electrons, use this little formula. 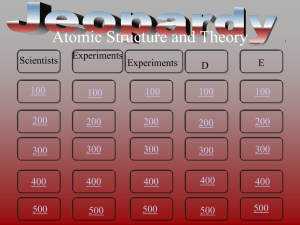 S Atomic number (Z) is 11 (find this on Periodic Table) and ionic charge is 1. S Ex: Suppose we have a sulfur ion with a - 2 charge. 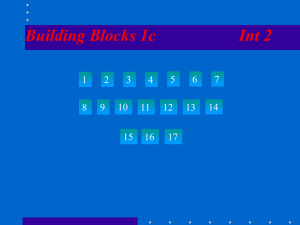 another property, called mass number. THE SUM of protons and neutrons. S So, what is Z again? S Let’s look at an example. Number = 80. How many neutrons does it have? S We use the symbol D to represent H-2. S We also use the symbol T to represent H-3. system (and probably kill you). S Look at gold (Au) on the periodic table. It says that the mass = 196.967.
the periodic table are averages. have the same number of protons. S They are different ALLOYS. mixtures of copper and gold. average atomic masses to 1 decimal place. average atomic mass of Chlorine that we’ll use. S Why is that wrong? 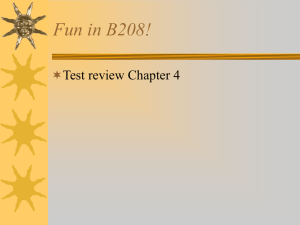 Next you should look at the Chapter 5 power point.